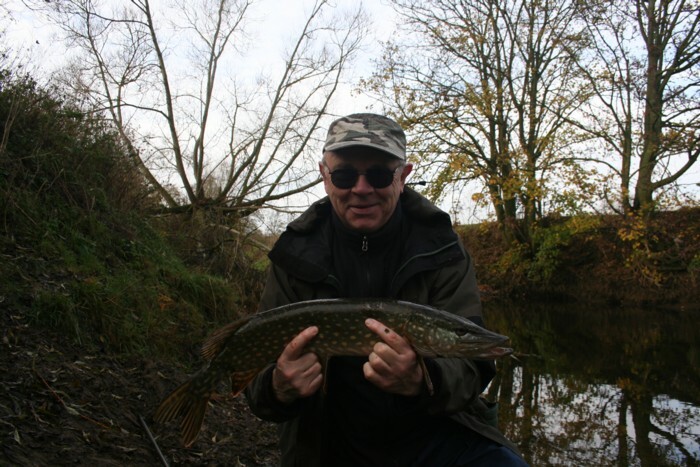 Gerry had contacted me to learn how to catch pike and more importantly how to handle and unhook them on the bank. We had a couple of days to do this. Gerry is primarily a fly fisherman. He sometimes fly fishes for bass in Ireland something I’ve not done before. He clearly enjoys his fishing. We started off with explaining the rigs and how they work. This we did in some shallow water which illustrated the action perfectly. We were wobbling baits or sink and drawing. So once Gerry was happy we started off upstream towards the top end of the fishery. As we walked upstream we saw one pike of about 15lbs or so sitting in a shallow swim, however it caught sight of us too and swam upstream to deeper water. On reaching our destination I cast in just to start Gerry off and blimey a pike took the bait. Quickly handing Gerry the rod we waited a few seconds before striking and pulling the bait (smelt) from the pikes mouth. This time Gerry recast and the pike took again and a similar outcome was made. For the third time the pike took and with exactly the same response. By now the pike didn’t want to play any more and I wasn’t too surprised. We moved downstream and noted another pike but in a position on the far bank which was an easy cast to but landing it on our bank was impossible. The next swim produced a small pike quickly. 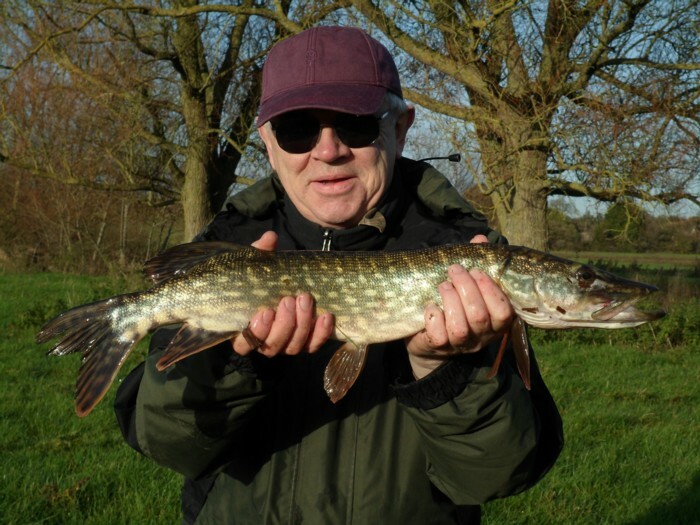 I showed Gerry how to unhook the pike on the unhooking mat, and he soon had the method sorted out himself. 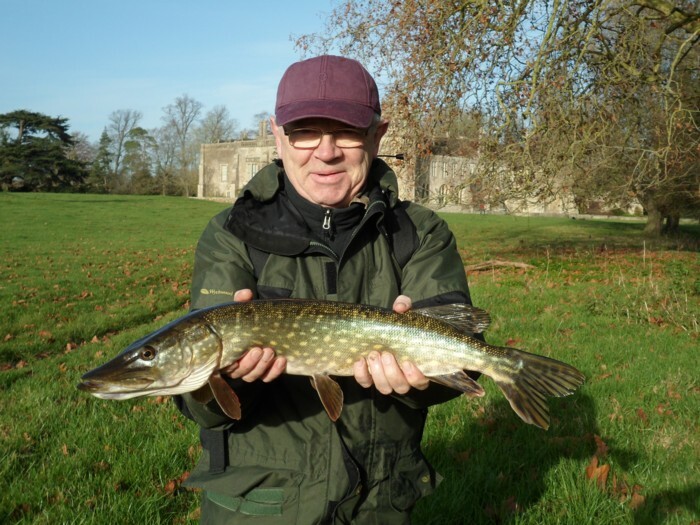 We carried on fishing down through the swims even the one with the 15lb fish and had a couple more takes however the pike didn’t hang on the end. I said to Gerry that I tended to strike early as I don’t want any deeply hooked fish. We walked back to the top end of the fishery again to try for the pike we lost in the first swim. Guess what he came out to play again and this time we hooked for a short while only for it to get free again. Meeting the next day we started off in the same swim as above with nothing coming along. Moving along the fishery we had another pike that almost took the bait under our feet. Then as we move further down Gerry hooked a pike that again wasn’t that large but did fight well. We had decided that in the afternoon we would move to another stretch. So after lunch on a sun drenched day we headed off. To be fair the sun was out for most of the two days and combined with a very low and crystal clear river the pike were going to be feeding early and late in the day. Arriving at the next stretch there were 3 pike fishers there. I don’t like fishing through swims that others have fished and the banker swim had produced 3 pike so my chances there were not good. We did fish along the stretch to see who was at home. By now the clouds had started to fill the sky and it started to rain, only a light shower though. One swim we fished produced a take from a pike. Gerry let it take a little line and we missed it. Casting out again and letting the bait stay in the area where the pike took produced a bobbing float and then it sailed away. The strike was met with no resistance. A few casts in the swims back to the car produced nothing, again I’m unsure whether the other pike fishermen had fished them. So each day produced a good few chances and a few fish landed. I was very pleased with the outcome as Gerry’s casting had improved remarkable as the sessions wore on. And he can now safely land and unhook pike without doubt. The only thing that baffles me is that we had no bigger fish coming along. However you are only one cast away from a good pike. This entry was posted on Monday, November 28th, 2011 at 10:58 am	and is filed under Uncategorized. You can follow any responses to this entry through the RSS 2.0 feed. Both comments and pings are currently closed.